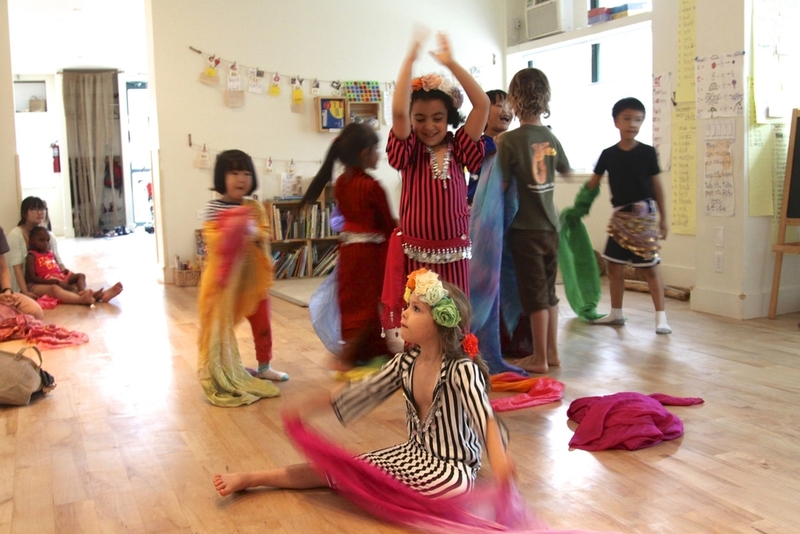 It was another week of exploration and discovery at summer in Pono! 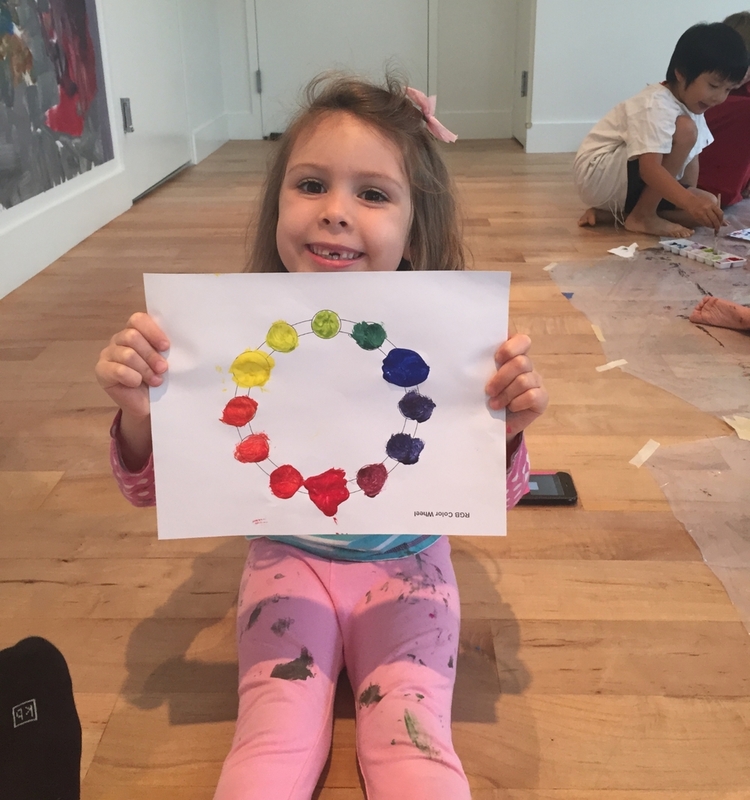 On Monday afternoon Poppy Luca brought color wheels for each child to fill in and talked about primary, secondary, and even tertiary colors. Everyone enjoyed mixing colors together and seeing the new hues! Poppy then invited the children to paint the terracotta sculptures they had made two weeks earlier. The children dipped their brushes in bright acrylic paints, remembering to clean their brushes between colors. The painted sculptures represented a variety of points on the children’s color wheels! Pono student Jasper led an informative class on Tuesday about the world’s five tallest buildings: the Burj Khalifa, Shanghai Tower, the Makkah Royal Clock Tower, One World Trade Center, and CTF Finance Centre. He brought in photos of each one and shared fun facts. Did you know the Burj Khalifa in Dubai has a dizzying 163 floors?! Jasper even showed us pictures of himself at the observatory of one of the top five tallest towers, NYC’s own One WTC. Jasper’s Pono friends had a great time with the fun activity he had planned for them, making their own postcards with mini pictures of skyscrapers! On Thursday, we welcomed back the one and only Dr. A. She brought stones, soil, earthworms, rooted plants, and jars and invited the littlest Pono friends to make their own terrariums. Zuri’s laugh was infectious as an earthworm wriggled on her palm! Later, Dr. A met with the older children and explained how to define an ecosystem. After a lively discussion, the children decided that Pono itself is an ecosystem full of biotic (living) and abiotic (nonliving) interactions. 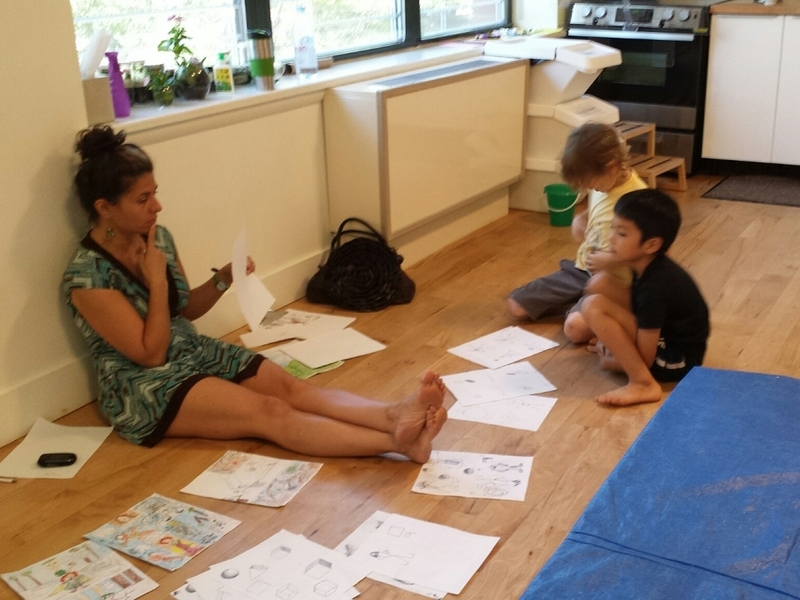 They also identified the roles that plants, animals, and people play in the Marcus Garvey Park ecosystem. Then it was time for the older children to make their terrariums. The sunny ledge in our Pono kitchen now has a lovely row of enclosed ecosystems! We had a treat on Thursday afternoon when professional belly dancer Lâle Sayoko returned to Pono after visiting us last summer. She is the rare teacher who can lead a class entirely by example. 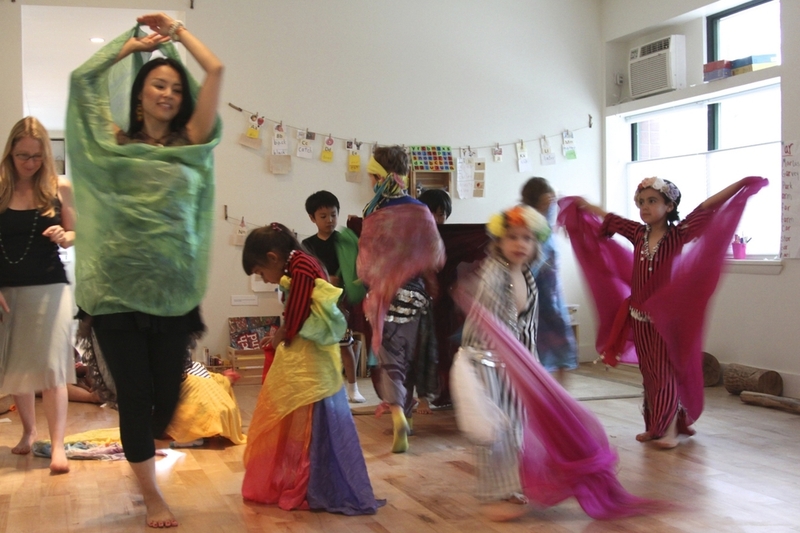 Accompanied by a talented drummer, the children followed Sayoko’s lead with expressive arm, hip, and chest movements and danced amidst a swirl of colorful scarves. We got into the swing of things on Monday by building and playing our own mini-golf course! The children made putting greens by stapling together pieces of green felt and then got creative with cardboard boxes, blocks, construction paper, and craft sticks. Soon our golf course featured colorful arches, tunnels, and ramps of varying degrees of difficulty! Oscar demonstrated how to correctly use a putter and then everyone tried out the course. The Pono golfers declared it a great success! During group literacy with Julietta the younger children finished their much-awaited His book. They enjoyed creating comical, inventive sentences and ever more intricate illustrations. It has now joined other renowned Pono titles, including It, Off, For, The, and I See. Look for it in the crate of big books in Pono's library! The older children began investigating two new sets of sound families and forayed further into the wild and whacky world of English print. They're beginning to learn how these particular word families look and work, and who some of their members are. Perhaps they'll have the chance to apply this new information in their next visit with Shirley Holmes? Stay tuned! Our math lesson this week was especially enriching! 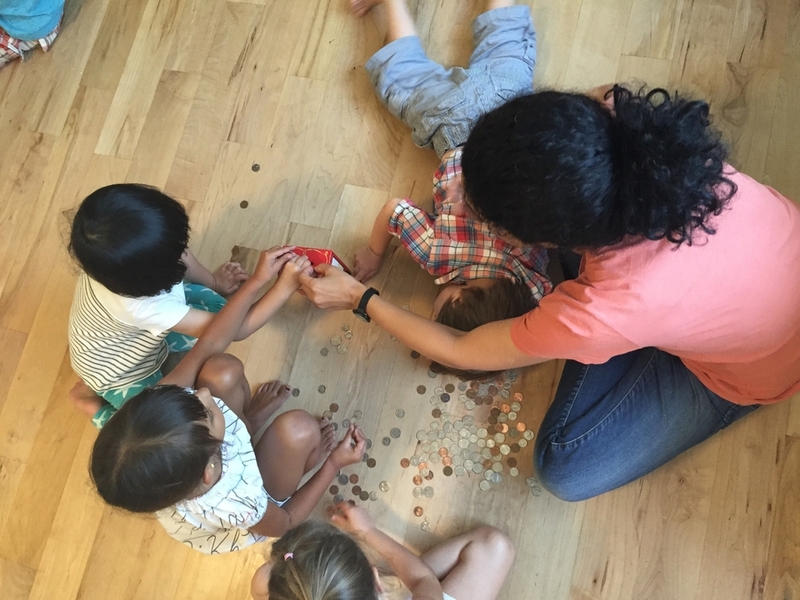 The younger children compared pennies, nickels, dimes, and quarters, while pairs of the older children figured out their share of the treasure in cents. Then it was time for making sushi! Some of the children had helped Maysaa make sushi rice during morning stations, and now it was time to cut up avocadoes and red bell peppers. The children spread their rice on sheets of nori (seaweed), added their veggies, and rolled it all up. The sushi took some time to make, but the children gobbled up the rolls in seconds! On Tuesday afternoon, Kate brought ingredients for flower “soup” to Marcus Garvey Park. Our littlest Pono friends snipped blossoms, stems, and even parsley and stirred it all into a large tub of water. Vibrant yellow, pink, and orange petals made a beautiful floating bouquet. The children decided their soup needed more ingredients (Bodi suggested salt! ), so they added grass, stems, and leaves to the mix. Hinako also joined in the fun and scooped the concoction into cups, which she artfully arranged on the tarp. On Thursday, Poppy and the littlest Pono friends made 3-D sculptures using white foam board and glue. Their creations look ready for MoMA! 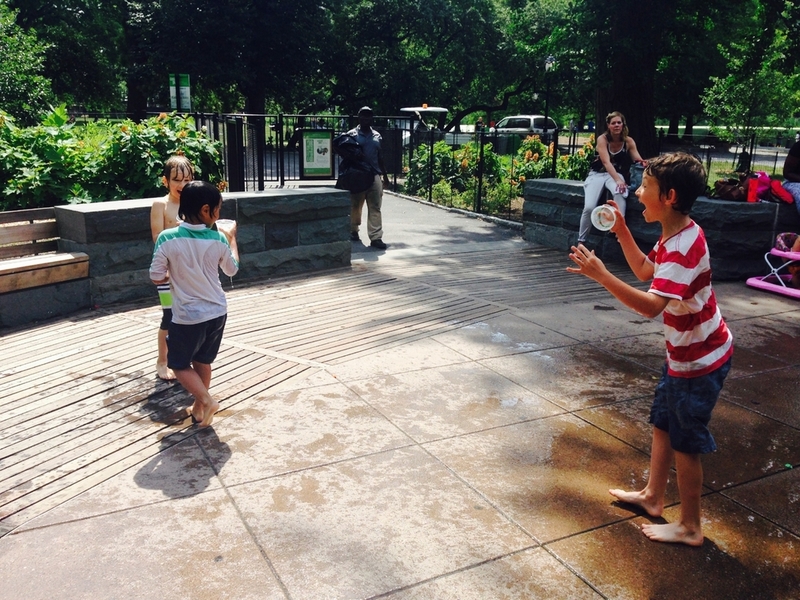 Temperatures soared on Wednesday, but we kept cool at the East 110th Street Playground in Central Park. Many Pono friends (little and big) played in the dancing water jets and filled buckets and cups to playfully splash each other. Jasper and other children even watered plants around the park. The children also enjoyed climbing and swinging in the shaded playground and made new friends playing tag. Some of us visited the Dana Discovery Center’s interactive exhibit “Ponds, Pipes, and People: Water In Center Park.” Later, Bodi, Oscar, Sulaf, Jasper, Kate and Maysaa strolled around the Harlem Meer and ventured into the park’s North Woods. They spotted turtles in the Meer and Oscar and Bodi kept an eye out for interesting birds in the woods. This Friday, as fate would have it, two of our Pono superheroes were called into action and couldn't be at Headquarters to work on their book. This left only Stone (alias Roly/Aure) and Flame (AKA Towa) to hold down the fort. We didn't want to move ahead in the plot without our other teammates, so "Towa" and "Aure" worked on their characters' bios, which will introduce the comic book. Over the past few weeks their characters have developed clarity and nuance. WARNING—they harness great power! Have a lovely, summery week!